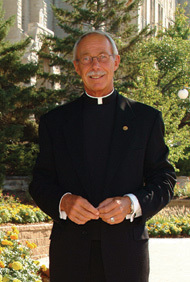 President of Creighton University since 2000. A native of Dubuque, Iowa, I entered the Wisconsin Province of the Society of Jesus in 1963. I was ordained in 1973. After finishing my graduate program I returned to Creighton to teach in the political science department, having taught there one year in 1969-70. Having been enticed into academic administration I traveled across the midwest in various capacities, ending in 1991 as President of the University of San Francisco. Nine years later my odyssey found me back at Creighton. The time set aside for reflecting on the readings in preparation for Sunday preaching or writing a daily reflection is very special time. It is time away from the affairs of the university in its multiple dimensions. It allows me to be with my God and to stretch my heart a bit more and as Hopkins says, to let the Spirit "sit and brood."